The world is now divided into two camps. There are the people obsessed with the new "Pokemon Go" augmented reality game, rambling around their neighborhoods, smartphones in hand, seeking colorful creatures with monikers like Squirtle, Clefairy and Poliwag. Then there are the people trying to figure out what the heck is going on. America's utilities found themselves in the latter camp this week. In the wake of the "Pokemon Go" game release, electric companies across the country are warning players against entering power plants and substations on the quest to capture Pikachu. 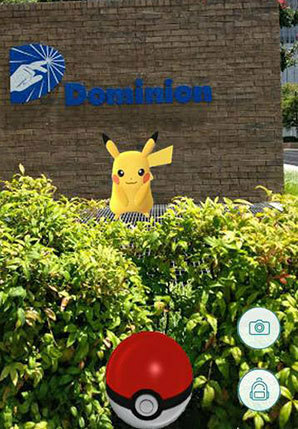 Dominion Virginia Power issued a warning on its Facebook page this week to "Pokemon Go" players, telling them, "If you see Pikachu hiding by a substation or a power plant, DO NOT chase him -- it's a trap! He is trying to get you arrested or even injured! Please always be aware of surroundings as you play and good luck catching them all!" Photo courtesy of Dominion Virginia Power. 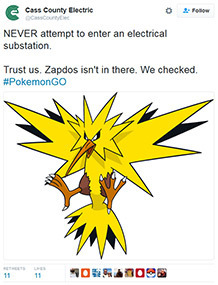 "Personal safety > catching 'em all," Duke Energy Corp. tweeted yesterday. "Please be aware of surroundings while playing #PokemonGo." "Pokemon Go got you going places? While you play, PLEASE STAY AWAY from electrical substations and other utility equipment," Entergy Corp. tweeted Wednesday. "NEVER attempt to enter an electrical substation. Trust us. Zapdos isn't in there. We checked," tweeted the Fargo, N.D.-based Cass County Electric Cooperative. In search of certain varieties of animated monsters, Pokemon players are apparently wandering too close for comfort to electric infrastructure, and it has power companies on edge. "Gamers have shown up at our power plants, and there was some discussion that you could catch electric type Pokemon near substations and transformers," American Electric Power spokeswoman Tammy Ridout said in an email. "Apparently Pikachu, who as you probably know is one of the most recognizable Pokemon and the Pokemon mascot, is electric," Ridout said. "With how quickly the game grew -- basically overnight -- we wanted to spread the word about the dangers of electrical equipment so players wouldn't attempt to go near it." AEP tweeted out its own warning Wednesday: "Every good trainer knows safety is important, especially around electricity. #PokemonGo #HighVoltage." The developer of "Pokemon Go," Niantic Inc., did not respond to a request for comment in time for publication. But when players open the "Pokemon Go" app, a warning pops up alongside a cartoon of a fierce-looking dragon looming above an unsuspecting "Pokemon Trainer." "Remember to be alert at all times. Stay aware of your surroundings," the game says. Despite this alert, "Pokemon Go" players are gaining a reputation for not engaging well with the "reality" part of the augmented reality game. Power companies are worried that players may unintentionally end up in places where they could be seriously injured. "Warning signs are there for a reason, but you need to be paying enough attention to see the signs," said Edison Electric Institute spokesman Brian Reil. The Fargo, N.D.-based Cass County Electric Cooperative is among many utilities warning "Pokemon Go" players to stay out of their substations. Courtesy of the Cass County Electric Cooperative via Twitter. No power companies or organizations contacted for this article reported that an incident related to "Pokemon Go" has actually occurred. "We don't have reports of people putting themselves in harm's way, but we recognize the game is gaining popularity and we are reminding customers and the public of the need to prioritize safety," Duke Energy spokesman Sean Walsh said in an email. But the game's design has many in the industry on high alert. Players go to real-world locations to catch Pokemon and other items in the game, some of which might correspond to real-world locations that aren't safe, Daniel Majano of Electrical Safety Foundation International said in an email. "The Pokemon out in the wild are supposedly supposed to match the area they're in (water Pokemon will be found near water), so users may think that searching near a substation, transformer, or overhead power lines will net them electric Pokemon, without thinking of the potential risks," said Majano. "Additionally, we can see some potential problems if players ignore the signs of an impending electrical storm and not seeking shelter." Ridout said AEP warned employees to watch out for players while driving "and to make sure they report any potential security concerns near our facilities." The Edison Electric Institute, which is an association of shareholder-owned electric companies, is encouraging its members to be proactive about the Pokemon phenomenon. Some are even considering contacting the game developer, said Reil. "I think there's ways in which you can reach out and say 'please remove us as a location for this game,'" said Reil. "I imagine that is something that many companies out there are looking into."